When the 300 places for the Rolex Fastnet Race were filled within 10 days of the entries opening, it became obvious that 2011 would be a notable year for offshore racing with the Royal Ocean Racing Club. With 300 miles of offshore racing required from each boat before the start of the Fastnet, the early season races were well subscribed with entries and over 100 boats entered three of the qualifying races. Hopes of an easy qualification for the main race of the season (Rolex Fastnet) were dashed by the weather early on. Strong winds and lumpy seas characterised the races and tested the crews and their yachts thoroughly. The Somerset Memorial Trophy for the Yacht of the Year for 2011 has been awarded to Niklas Zennström's JV 72, Rán. Zennstrom and his crew have had an outstanding season, winning IRC Overall in the Rolex Fastnet Race in consecutive years, the first time this has been achieved since Carina II in 1955 and 1957. 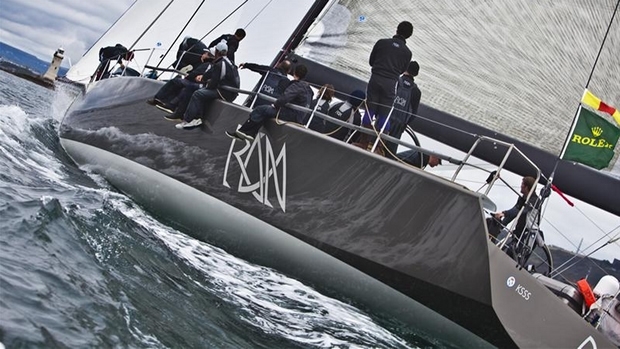 Rán also won the Rolex Mini Maxi World Series for the second year in the row as well as obtaining a good result in the Rolex Sydney-Hobart Race. Rán is currently planning to head to the Caribbean over the winter to race and the team are looking forward to competing in the RORC Caribbean 600. The Dennis P Miller Trophy for the performance of a British Yacht Overseas, has been awarded to British Soldier. Skippered by Lt Col Nick Bate, the yacht travelled from the UK to the Caribbean to compete in the RORC Caribbean 600 as the first race of the Atlantic Ocean Racing Series, in which it was the smallest yacht. They then competed in the Annapolis-Newport Race, Transatlantic Race (Newport to Lizard) and Rolex Fastnet Race, covering 11,000 miles. The yacht had a different crew for each race, including an injured soldier/amputee in each event. In total, 69 soldiers took part, only four of whom had ever crossed an ocean before. In the IRC Classes the best five offshore races are counted towards the RORC Season's Points Championship. These were heavily contested and in some of the classes, the results were undecided until after the Cherbourg Race, the last race of the season. As in 2010, Piet Vroon's Ker 46, Tonnerre de Breskens 3 swept the board in IRC Overall, finishing the season 62.5 points ahead of Niall Dowling's J/111 Arabella. As well as the trophies for IRC Overall and IRC One, Tonnerre will also collect the Stradivarius Trophy for the best overseas yacht. The Overall results in IRC, with all races to count, were dominated by a few intrepid boats travelling around the country to also take part in the RORC races not run from the Solent. Niall Dowling's J/111, Arabella was one of these boats, competing in 10 races over the course of the season and winning the Alan Paul Trophy for consistent high performance in IRC Overall. IRC Zero went to Derek Saunders and the CM 60, Venomous. By completing five races, they secured their victory from Bob, Rob Gray and Sam Laidlaw's Farr 52, who came in second. Bob also win the Peter Harrison Youth Trophy for the season having taken part in all their races with at least 45% of crew under the age of 25. IRC One was led from the start by Piet Vroon's Ker 46, Tonnerre de Breskens 3 and despite good attempts from two other Ker designs: Jonathan Goring's Ker 40, Keronimo and Mike Greville's Ker 39, Erivale III, they could not be knocked off the top spot. Keronimo came second in IRC One with Erivale in third. Freddie Neville-Jones, sailing on Erivale was awarded the Duncan Munro Kerr Youth Challenge Trophy for the crew member under 25 who has sailed the greatest number of offshore miles in the season. In total he raced 1,338 nautical miles, including the Rolex Fastnet Race. In IRC Two Neil Kipling's J/122 Joopster came in first with a consistent set of results. Second and third place were close with Ross Applebey's Oyster 48 Scarlet Oyster coming in ahead of Peter Rutter's Grand Soleil 43 Quokka 8. Scarlet Oyster relished the heavier conditions, especially in the Myth of Malham and Morgan Cup races where she came first in class. Quokka was crewed by a team from Sailing Logic who missed winning the Roger Justice Trophy for the best sailing school yacht in IRC Overall, after a good result in the Cherbourg Race allowed their fellow Sailing Logic yacht, Visit Malta Puma, to move ahead in the points. IRC Three was won for the second year in a row by Frenchman Noel Racine's JPK 10.10, Foggy Dew. With four race wins in class this season, the boat was going to be hard to beat from the very beginning. Foggy Dew was raced fully crewed, but the next four boats in the class were all Two-Handed boats, showing the continual increase in popularity of this discipline. Peter Olden and Nigel Pipe, sailing the A-35, Solan Goose of Hamble and Nikki Curwen and Alex Adams, sailing the J/105, Voador came in second and third respectively. IRC Four was also won for the second year in a row by the same French sailor: Jean Yves Chateau's Nicholson 33, Iromiguy. They had a good finish to the year winning their class in the Rolex Fastnet Race. This result put them ahead of the next two boats in class: Matthias Kracht's JPK 9.60, Ultreia! and Ian Braham's MG 346, Engima. Only 5.4 points separated the second and third places at the end of the season. Ultreia! was beaten to first place in IRC Four, but managed to hold an unbeatable lead in the Two-Handed Class by the final race in the season. They were so confident of the win in this class that they raced fully crewed in the Cherbourg Race to try and win IRC Four as well. Unfortunately for them, Iromiguy held them off for the victory. Nicolas de la Fourniere and Martin Imbert's X-34, Exile/Mirabaud came back from their win in the 2009 season to try to reclaim the Two-Handed trophy, but could only manage second place with Solan Goose coming in third. The Assuage Trophy is a championship for RORC members and is awarded to the yacht with the best results from the Cherbourg Race plus three other races from the Cervantes Trophy, Morgan Cup, Myth of Malham and Cowes-Dinard-St Malo races. This year the trophy has been won by the RORC Commodore, Andrew McIrvine, with his First 40, La Réponse. Much to the joy of the crew who were disappointed to come fourth in IRC Two, only half a point behind Quokka, after retiring with gear failure from the Rolex Fastnet Race. The annual trophies will be presented at the RORC Annual Dinner held at the Banqueting House in Whitehall on Saturday 19 November.